The Democratic attorneys general who investigated and charged the two videographers behind the 2015 tapes revealing Planned Parenthood's efforts to sell fetal tissue have received tens of thousands of dollars from abortion supporters. "The right to privacy is a cornerstone of California’s Constitution, and a right that is foundational in a free democratic society," Becerra said in a statement announcing the charges. "We will not tolerate the criminal recording of confidential conversations." This is not the first time that Daleiden has faced criminal charges in connection to the series of videos, which featured Planned Parenthood executives and doctors discussing how to "line item" body parts harvested from aborted babies to maximize profits. A Texas grand jury approved charges against the videographers in January 2016; a judge later called the grand jury decision a "defective indictment" before dismissing all charges in July. Daleiden said that California's decision to charge him is just as politicized and empty as the Texas case. He also highlighted the case of DV Biologics, one of Planned Parenthood's California partners featured in the undercover videos. DV Biologics executives have been charged by the Orange County District Attorney's office with turning massive profits from the organ trade. A judge dismissed the defense's bid to drop the charges on March 25. "The bogus charges from Planned Parenthood’s political cronies are fake news. They tried the same collusion with corrupt officials in Houston, TX and failed: both the charges and the DA were thrown out," Daleiden said in a statement. "The public knows the real criminals are Planned Parenthood and their business partners like StemExpress and DV Biologics—currently being prosecuted in California—who have harvested and sold aborted baby body parts for profit for years in direct violation of state and federal law." Harris was the 12th largest recipient of contributions from pro-choice groups, receiving $39,855 from the abortion industry as her office was investigating Daleiden, according to the Center for Responsive Politics. Becerra served in the House of Representatives for six terms before being appointed to Harris' seat. He received more than $7,600 from Planned Parenthood and NARAL, which also gives him a 100 percent rating on pro-choice positions. The Attorney General's office did not return a request for comment about the donations. Daleiden said the donations reflect the political nature of the charges, adding that the $45,000 is "equivalent to about 842 little baby hearts, lungs, livers, and brains purchased at Planned Parenthood per their contracts with StemExpress" in an email to the Washington Free Beacon. Daleiden said that the charges would not affect the Center for Medical Progress' activities, saying in a Tuesday press release that he looks "forward to showing the entire world what is on our yet-unreleased video tapes of Planned Parenthood’s criminal baby body parts enterprise, in vindication of the First Amendment rights of all." "If the fetus comes out with any signs of life, we’re supposed to transport it to the hospital," she said, prompting a CMP videographer to ask if there is "any standard procedure" to such a situation. "The key is, you need to pay attention to who’s in the room, right?" Taylor said in response. 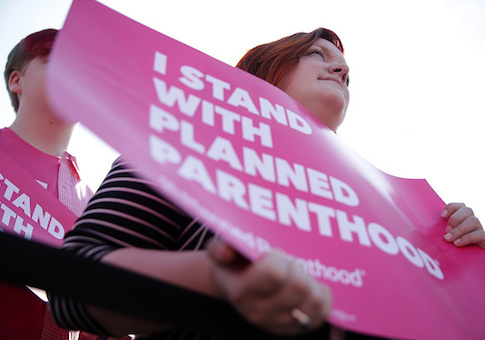 Planned Parenthood has denied all wrongdoing in connection to its organ harvesting operations, though it did stop charging money for body parts after the video's release. Spokeswoman Mary Alice Carter said that the prosecution against Daleiden vindicates the nation's largest abortionist. "The California attorney general filing criminal charges sends a clear message that you cannot target women and you cannot target health care providers without consequences," she said in a release. Planned Parenthood did not return request for comment about Taylor's comments in the latest video. This entry was posted in Politics and tagged Planned Parenthood. Bookmark the permalink.